Pete's Scribblings: The Rolling Stones: Maximum Rhythm and Sues. The Rolling Stones: Maximum Rhythm and Sues. Getting Rich Quick in Richmond! Ever wondered how world famous super pop group The Rolling Stones began? Wonder no more. Here is the story, biscuit tins, Binatones, Chad Valley and all. The Rolling Stones. Hedonistic and decadent Rock n Rollers from England UK. Renowned for their excessive lifestyle and their ability to rock out hard, they were the Aerosmith of their day although not quite so popular. The Rolling Stones sprang out of the London suburbs of Richmond with a mission. A mission to rock! Brian Jones, a blonde and boastful man who claimed he could play all known instruments known to man. Bandolier and general snarlster Keith Richards and his banjulele. Pretty boy Bill Wyman - one glance from his baby blues and the ladies were a swooning as he did the crooning. Bill Wyman, master of languages which he put to good use in his smash hit ‘Si Si, Je Suis Un Rock Star’ and the owner of several residencies in Vence, France where he was wont to party like it was 1999 (although, in fact, we’re back in the sixties at present and Prince wasn’t to write that hit yet). An incredibly mouldy old drummer who no one can remember but who went on to play Grandad in ‘Only Fools and Horses’ as though he had been born to the role. And, of course, Mighty Mick Jagger, superspy, owner of a Chad Valley ‘Give A Slide Show In Your Own Home’ projector set and a Binatone portable cassette player which he would tote around in his duffel bag – a man for whom the term ‘Lips Synch’ would be coined due to his incredibly pouty mouth. 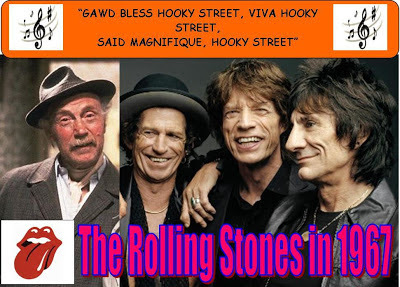 But, despite this impressive line up, The Rolling Stones soon fell on hard times. After one hit record, ‘Champion the Wonder Horse’, as arranged for biscuit tin and kazoo, they realised that none of them knew how to write rock n roll songs. Their first chart entry and appearance on ‘Top of the Pops’, had, by all accounts been a lucky strike; jumping up and down playing maracas and bashing biscuit tins in time to the TV theme had worked once, but a record buying public were hungry for more innovative material. They were forced to use subterfuge. It was only afterwards that Halford noticed the Binatone portable cassette recorder. This was an error of judgement he was to regret: ‘Smashing the Rules’ by The Rolling Stones was soon climbing high in the charts. The Stones were certainly innovative in their approach to hit making. Residents of Richmond, in 1968, were surprised and delighted to wake up one morning and find the town literally festooned with hand drawn posters declaring that the first ever British Summer Music Festival - ‘No Sleep Till Putney!’ - was to take place that very evening, bringing a much needed boost to the local economy. Eminent politicians were booked to speak and their would be personal appearances and poetry readings from footballing stars of the time such as Steve Foster and Gary Birtles. Even more impressive, practically every famous hard rocking band in the charts, at that time cresting on the peak of heavy metal’s burgeoning popularity, were booked to appear - and all in the garage of number 31b Slapton Close. But it was all to end in disaster and controversy. Biff was soon to regret his impulse to perform in the garage that day. ‘Tyres of Iron’ from the album ‘Steel Wheels’ by The Rolling Stones soon reached an impressive 27 in the hit parade. Intrigued, we wanted to interview The Rolling Stones, but after wandering around Richmond for a bit shouting, we couldn’t find them so we gave up. It later transpired that they had never heard of us and were, in any case, concealed in a French Villa. Tired of being considered by the music literati as somehow not quite as good as they used to be, The Stones gathered up their biscuit tins and buggered off to France. And, after writing this we were later informed that much of it is completely made up, historically inaccurate up and a complete lie. Grandad from ‘Only Fools and Horses’ has never played the biscuit tins in a band. Sorry.